Ask your students what it means to be a fluent reader. You’re likely to get a wide variety of answers. Chances are good that your students will provide correct answers… partially correct, anyway. 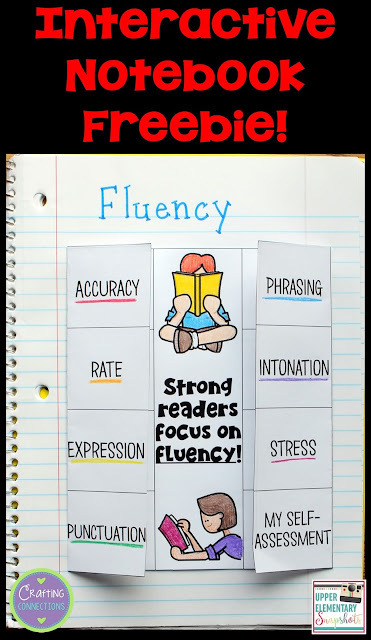 As we teachers know, when it comes down to it, reading fluency involves multiple components. First, there’s accuracy. It is easy to recognize how accuracy is related to reading comprehension. If students are failing to read several words accurately, the meaning of the text will be changed or lost. Knowing your students’ accuracy rate is critical because it will help you provide the correct reading materials for them. 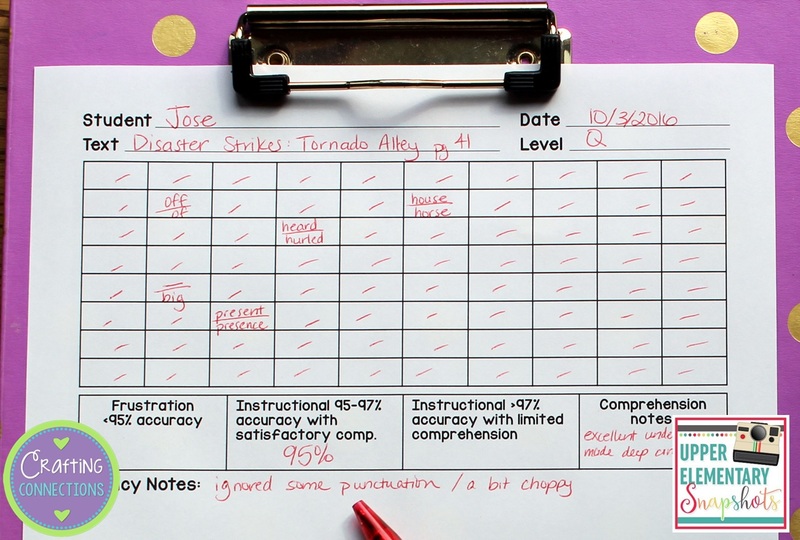 You can identify a student’s accuracy rate by finding the percentage of words in a text read correctly. 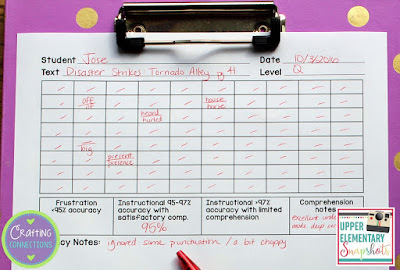 A fellow reading teacher once shared this simple recording sheet with me, and explained how she used it to track her students’ accuracy. As you can see, each recording sheet contains a section with 100 small boxes. Ask a student to read aloud to you. Draw a tick in a box for each word your student reads correctly. When your student misreads a word, draw a line across the middle of the box. Above the line, write the word they said. Below the line, write the word that was printed in the text. 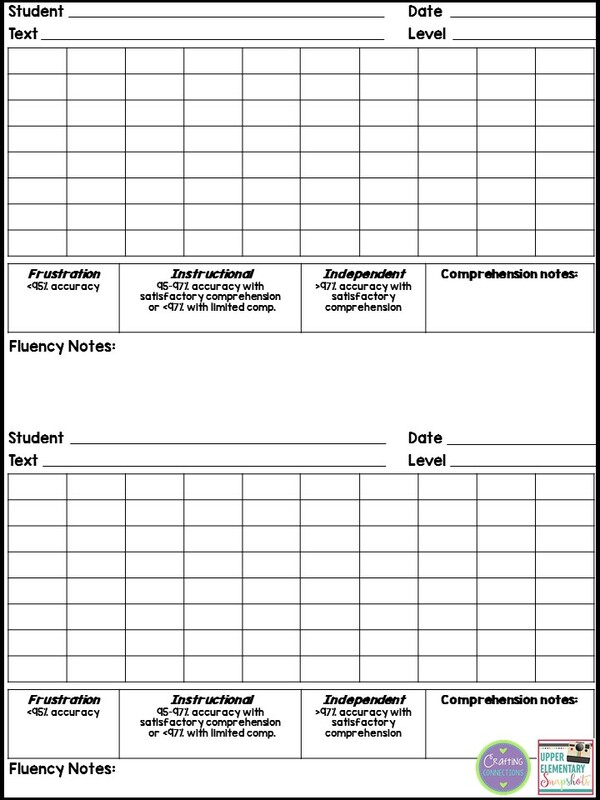 When you run out of boxes, you have hit 100 words, and you can easily calculate your student’s accuracy percentage. A student reading with 98%-100% accuracy with satisfactory comprehension is reading at his or her independent level. A student reading with 98%-100% accuracy with limited comprehension is reading at his or her instructional level. A student reading with 95%-97% accuracy with satisfactory comprehension is reading at his or her instructional level. A student reading with an accuracy rate of 94% or below is reading at his or her frustration level. Click HERE to access this recording sheet. Another significant element to consider is rate. 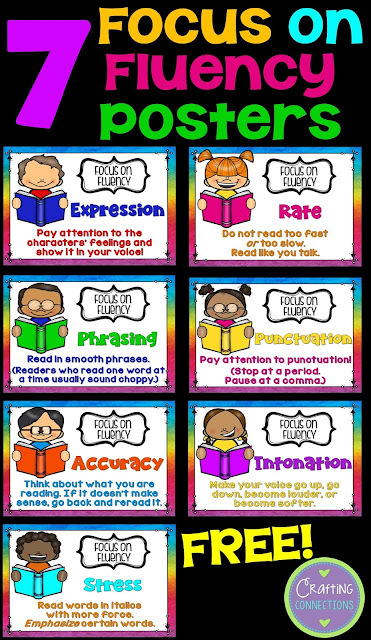 Is your student reading too fast? Too slow? I have found that many students think that the faster you read, the more fluent you are. We teachers know that this is not the case. When I find a student who reads too fast, I will say, “Whoa! My brain just cannot process what is being read when you read that fast! Would you please start over, and this time read a bit more slowly so that I can process what you’re reading to me?” I’ve also done a comparison reading with students: I read aloud a nonfiction passage super-fast and then ask them a few questions about what I read to them. When they are not able to answer my questions, I read at an appropriate rate. After they are able to answer the same questions I asked before, we discuss the connection between reading rate and comprehension. When I work with students who read too slow, I find texts at their independent reading level and have them read the same text multiple times, increasing the speed with each reading. Prosody is reading aloud with expression, smoothness, and stress. Prosodic readers pay attention to punctuation and italics. It is evident that they are comprehending the text because they know how to match their tone and pitch to what is being read. I tell my students that when a prosodic reader is reading, it is fun to listen to him or her. 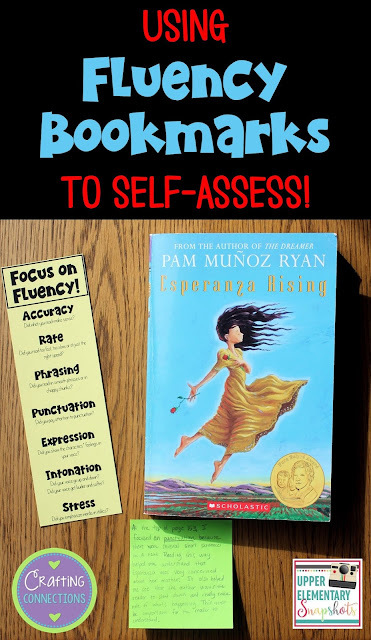 I also have bookmarks for students use as they are reading. Occasionally I hand students a sticky note, and ask them to jot down a note explaining how reading fluently helped them comprehend the text. I expect them to address at least one of the fluency components in their explanation. I LOVE helping students work toward becoming fluent readers! My favorite method is to use partner plays. 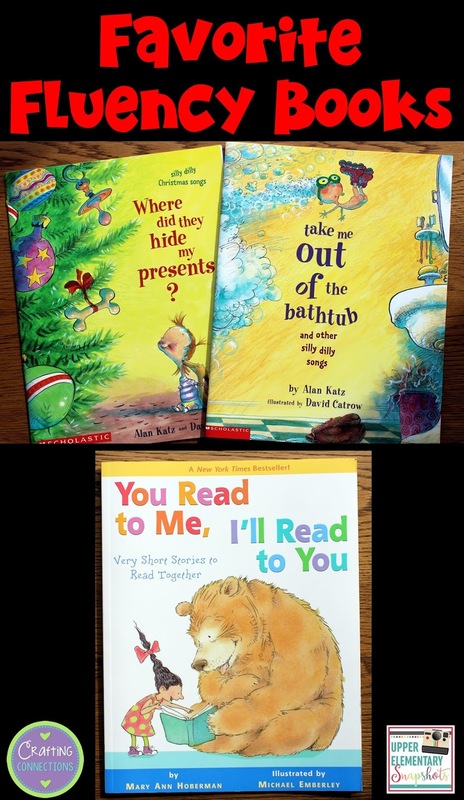 These are great reading center options. Students can read the script with a partner while the teacher is working with small guided reading groups. These scripts require exactly two readers, allowing students plenty of opportunities to read. I recently added a comprehension worksheet to each of my 4th and 5th grade partner play sets, so students can respond to questions about the scripts they read. 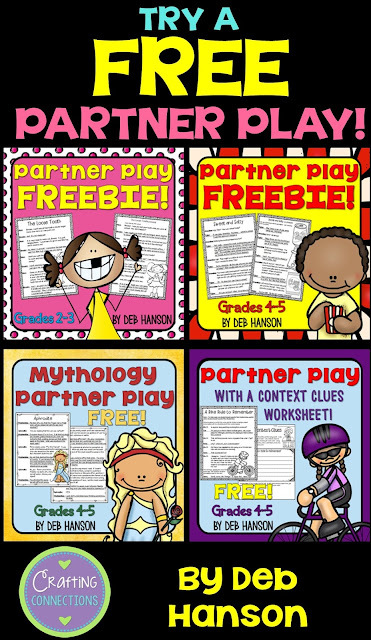 I also find partner plays to be powerful intervention tools. When I work with individual students as part of an intervention, I take one part, and my student takes the other part. Then, the student can hear me model fluent reading, and try to emulate that himself or herself. Plus, the students love partner plays!! If you want to try out one of my free scripts, click on the image below. 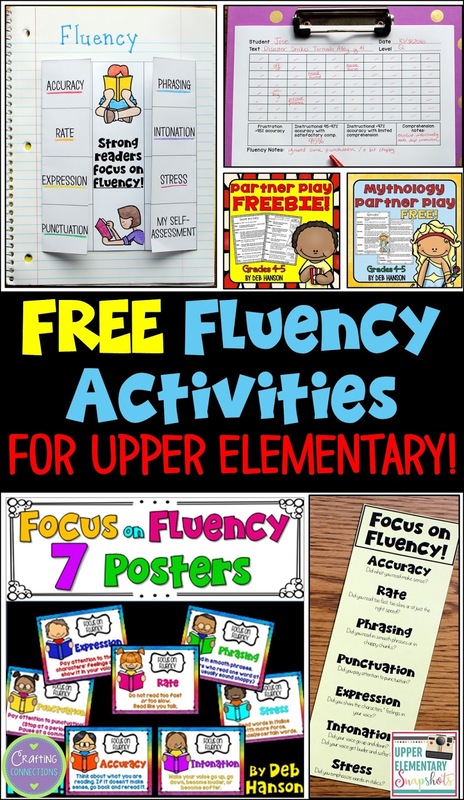 The following image shows some of my favorite published books that can be used as fluency-building activities! Students love the wacky lyrics found in the Alan Katz books! Whenever I have used these books with students, they beg to read their favorite pages again and again, and don't even realize that they are building fluency as they do the repeated readings. The You Read to Me, I'll Read to You books are great for students who are working to improve their phrasing while reading. 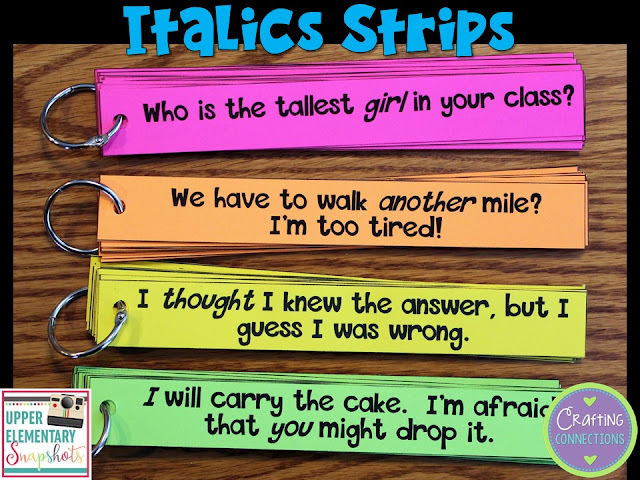 Using italics strips is another favorite activity. When I first became a reading teacher, I was surprised to discover that the majority of my 3rd, 4th and 5th grade students plowed through words in italics with no change in intonation whatsoever. I created italics strips to address this issue. Each set contains 100 strips. Set 1 features the first hundred Fry words, set 2 features the second hundred Fry words, etc. Therefore, the seventh, eighth, ninth, and tenth set are the ones geared more toward upper elementary. Thanks for stopping by today! I hope you'll be able to use a few of these fluency-building ideas with your upper elementary students!